We're still celebrating all things vintage OR vintage-inspired and you still have plenty of time to join us, which we hope you will! Remember that although we (especially Lauren, lol!) tend to embrace the antique, shabby-chic style of "vintage", there are all sorts of eras and styles that would work, including mid-century modern, 1960's psychedelia, 19050's sock-hop chic... pick a timeframe you like and go with it! Scroll down to the original post (just below this one) for all the details, including the fun prize from Lauren's Etsy Shop, Just Enough Stuff! Lauren says, "I've had these vintage red doilies in my stash for quite some time, and it was about time I used them. Torn layers are always a fun way to combine a few different papers, especially if you have smallish offcuts of various pages from old Ideals magazines, as I did in this case. 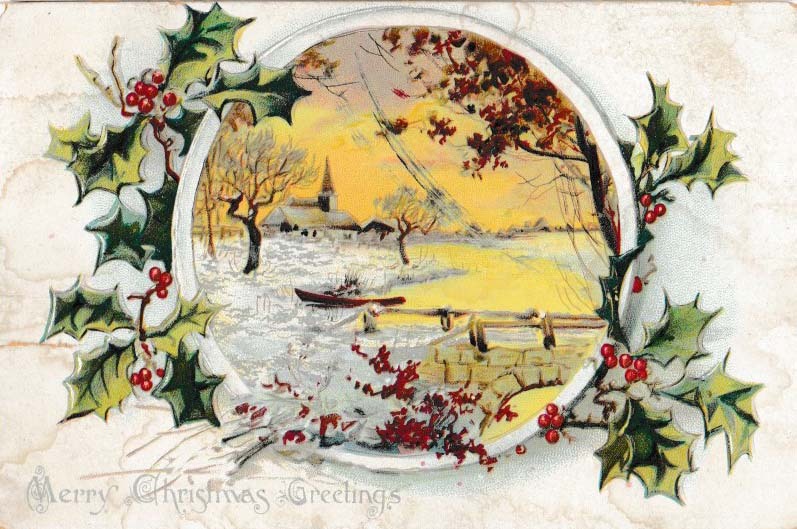 The Santa image is a trimmed down postcard that (as you can see) was no longer in good condition, but still too pretty to toss. 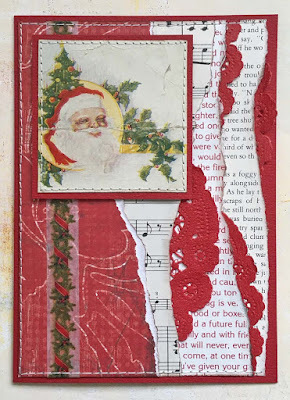 I backed it with red cardstock to frame it out, and also frankly to reinforce it, because the crease across Santa's face is on the verge of splitting in two. The nice thing about finding rather "distressed" vintage items is that they're much less expensive AND you needn't feel they're "too nice to use" lol!" 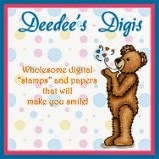 Stephanie says, "I had so much fun with my glue-as-I-go collage last week, I made another one. This time I started with a page from a vintage Pressure Cooker Recipe book. 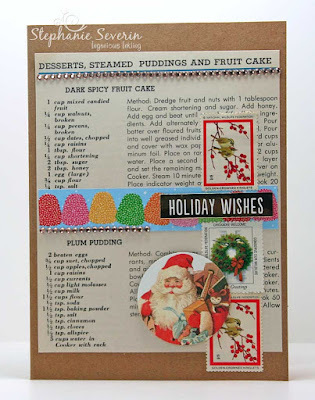 I added some gum drops and vintage stamps before finishing with a vintage Santa, some champagne gems and a metallic sticker sentiment." Remember, you have until 6pm (EST) on Wednesday, April 4th to link-up your card. 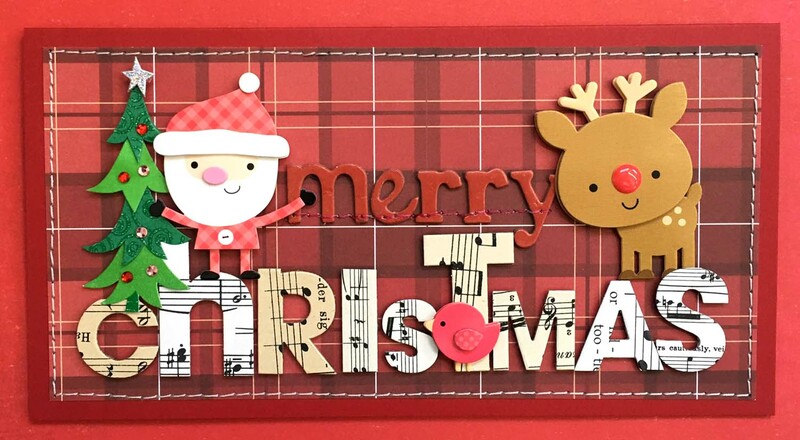 Description:This week we're celebrating the look and feel of Christmas long ago by making cards with an old fashioned feel. You might incorporate actual vintage paper or lace, or use any of the many beautiful vintage-inspired papers and embellishments on the market; even a stamp or illustration with an old-fashioned vibe as your focal point will work ... whatever speaks vintage to you! 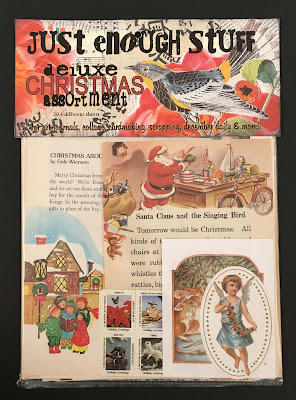 Stephanie says, "I did a *glue as you go* collage with lots of vintage bits and bobs from my stash ... sheet music, Ideals pages, and trading stamps. 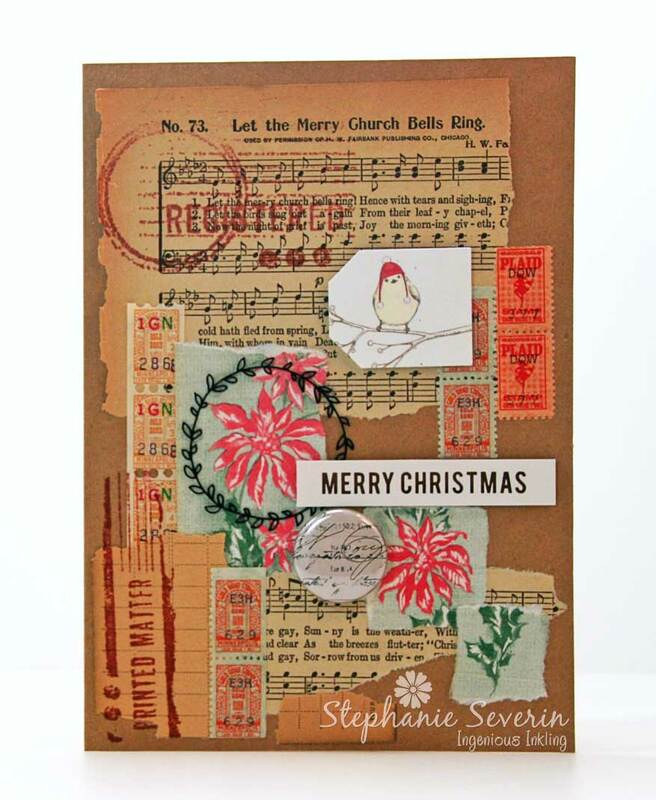 I did add a bird punched from a journaling card, a metal wreath, a sentiment sticker & a piece of flair (with vintage looking script on it) before adding a few stamped images from Seth Apter's Post Office collection." Lauren says, "I've hit all the categories for sourcing this time: I've got some actual vintage sheet music and lace from my stash, but the doily paper and doily scrap are new, commercially produced papercrafting supplies. 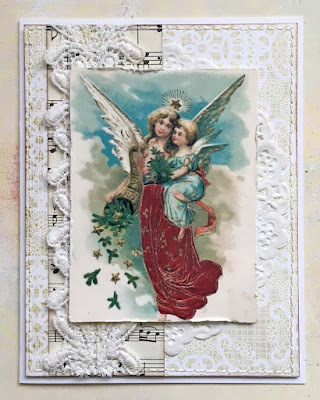 The angel image kind of splits the difference: I scanned an actual vintage postcard from my collection, reduced it slightly to fit my not-quite-A7 card, and hit the edges with a bit of Antique Paper ink and a distressing tool." Link up as many times as you'd like to, between now and 6pm (EST) on Wednesday, April 4th. Keyword for galleries and Flickr is JB:18:07. ...managed to totally rock this theme, despite not having much in the way of musical items in her stash. A great reminder to all of us that the only "product" you need to make a great card is CREATIVITY!!! 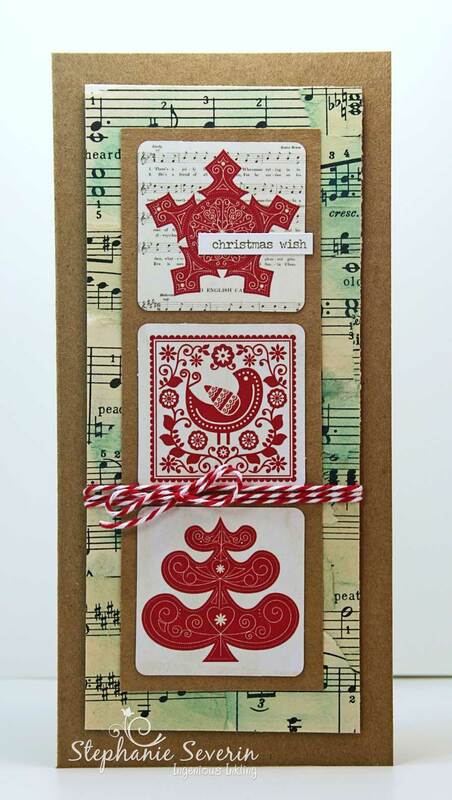 ...proved quite conclusively that the combination of diecuts and sheet music is absolutely ALWAYS a really good idea! ...convinced us that you definitely don't need a vintage vibe, a ton of layers, or even any COLOR to sing a beautiful song of Christmas! Many thanks to everyone who "sang along" with us this fortnight. We'll be back at midnight with a brand new prompt we hope will provide some good old fashioned inspiration! 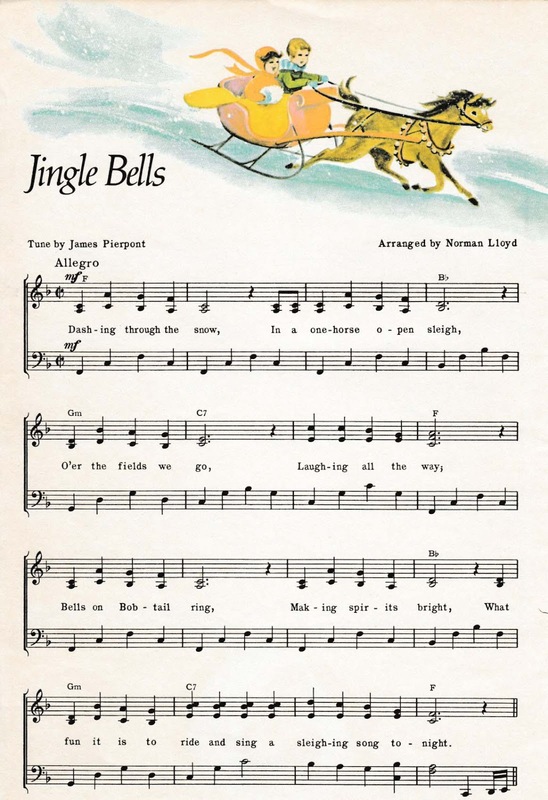 Welcome back for another week of MUSICAL creativity ... break out your favorite musical elements and join the holiday fun. 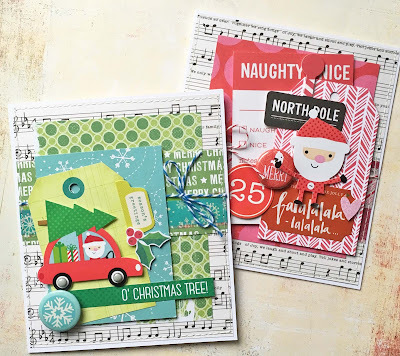 Lauren says, "There's nothing to say that sheet music can only be a background on our cards! 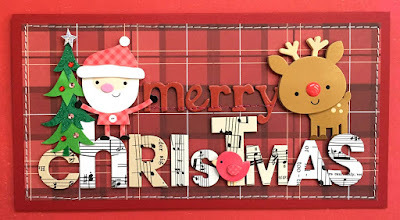 Here I've built a sentiment with my own diecut Music Alphas from my Etsy shop, Just Enough Stuff, then filled in with ordinary Xmas stash items: adorable, dimensional Doodlebug stickers, super-useful chipboard letters, and maybe the best Christmas plaid paper of all time, courtesy of Photoplay!" Stephanie says, "This was not the card I initially intended to make for this week's prompt ... but sometimes you fall in love with the cards from the leftovers more than the original creations (you can click through to see the original card and one other leftover design). I used musical papers, border & elements from Kaiser Kraft Frosted Collection. I accented with some vintage stamps from the National Wildlife Federation (that I stumbled upon when I was looking for some holiday stickers that are currently lost somewhere in my stash ... so much of my creativity is serendipitous." 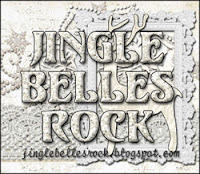 Remember, you have until Wednesday, March 14th at 6pm EST to link-up your holiday designs. 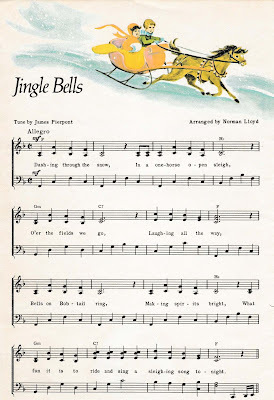 As you might have guessed from the title of this week's prompt - Hark the Herald Angels SING - we're celebrating music this week ... it might be sheet music, music notes, or even musical instruments. Stephanie says, "I used a few torn pages of vintage sheet music from my stash to create a collage background that I sponged with Evergreen Bough Distress Ink. 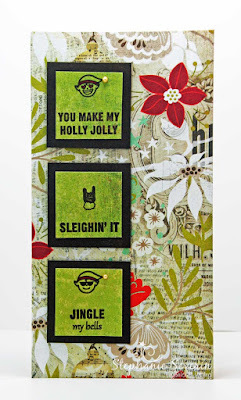 I cut my collage into three panels (you can see the other two cards & the collage on my blog). 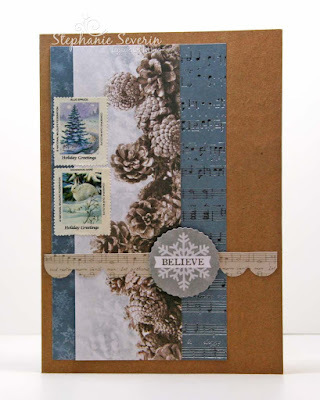 I added a wrap of twine and three journaling cards as focal images ... and finished with a sticker sentiment." Lauren says, "Be sure to click over to Stephanie's blog to see the collage and the other two cards! You will NOT be disappointed, I promise!" Lauren says, "You'll notice I made two cards. 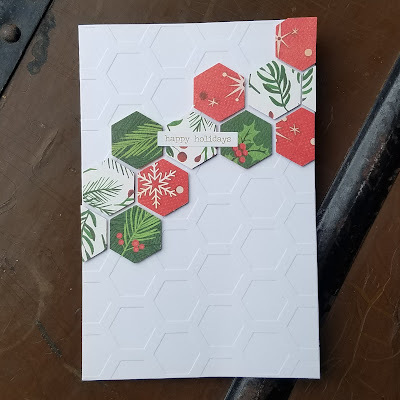 I've been trying to double up whenever possible this year, so that I'll wind up with a few more than 48 cards come December 1st. When I realized I had exactly twice as much as I needed of this Pebbles sheet music patterned paper, it seemed like a good idea to make two. Since I also have enough tags, stickers, badges and twine to make ALL of this year's cards (and then some, lol!) I had no trouble doubling the fun of this "lots of layers" design!" And now it's your turn! Link your music-inspired creations here by 6pm (EST) on Wednesday, March 21st. keyword for galleries and Flickr is JB:18:06. ...proved that inchies needn't be square or round, in fact, they should probably ALWAYS be hexagons! ...combined her inchies with a bigger square and a rectangle, to make an even more dynamic grid that we're sort of totally obsessed with! 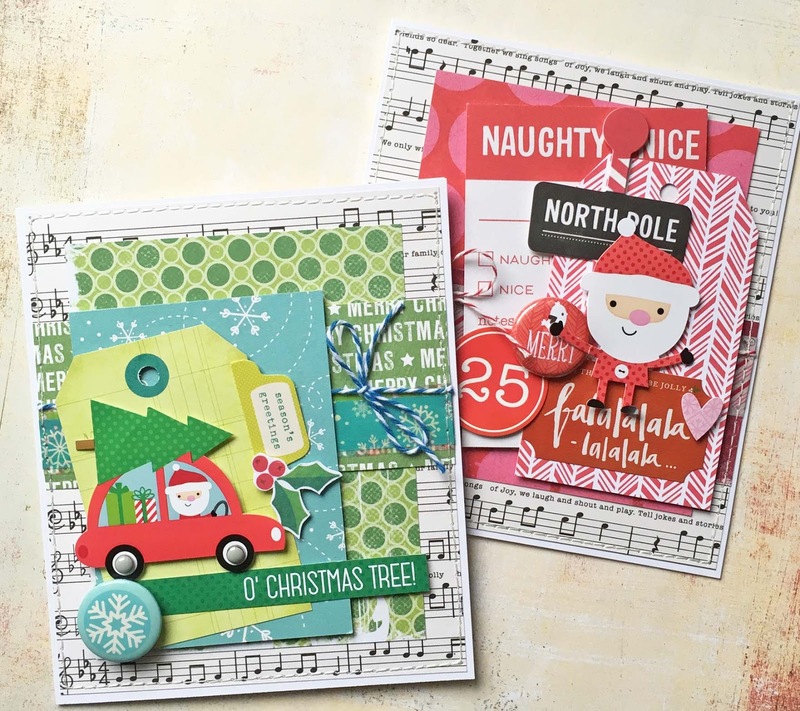 ...made her inchies into a pair of fabulous, quilt-like designs we can't wait to try! We're still creating with LITTLE things this week ... INCHIES or TWINCHIES; they can be square or round or... well, maybe you have a brand new concept on this idea, in which case, bring it on! 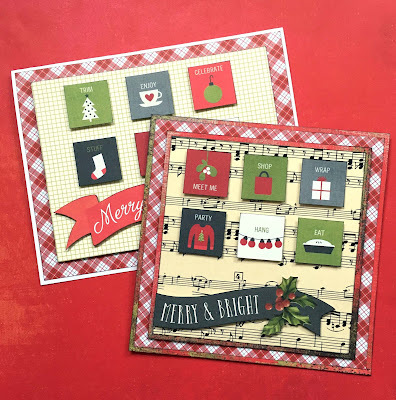 Lauren says, "I had really, truly, intended to make some tiny one-inch collages, this week; or at least cut a larger vintage image image up into one or two inch squares! 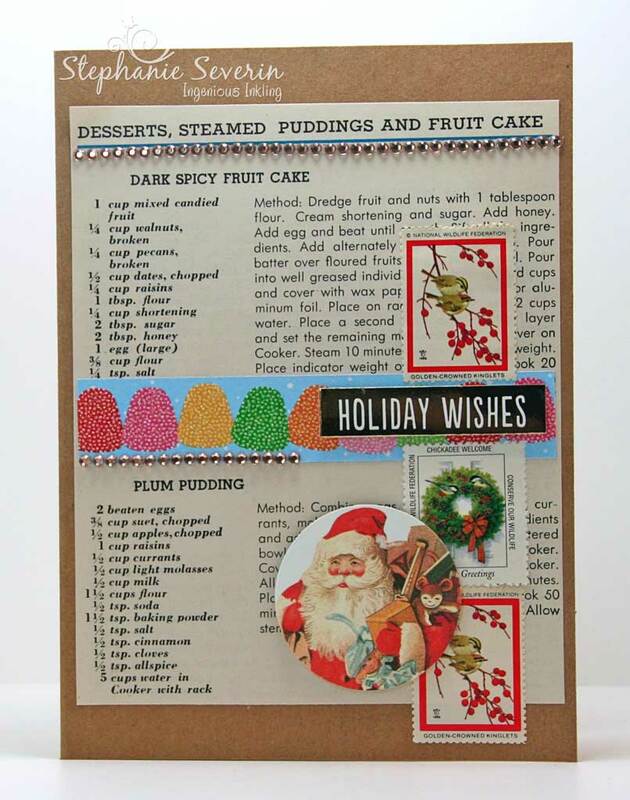 But then I found an oversized Simple Stories journaling card with all of these adorable tiny one-inch icons, just begging to be made into super-easy, flat, mailable holiday cards. And I mean, it would've been rude to say no, really, don't you think?! I went with an easy grid design and added fussy-cut sentiment banners from a couple of other journaling cards in the same collection." Stephanie says, "This week I inked-up the tiny Irreverent Elf Messages from Hero Arts to create my Inchies (they're actually 1 3/4" squares with mat). 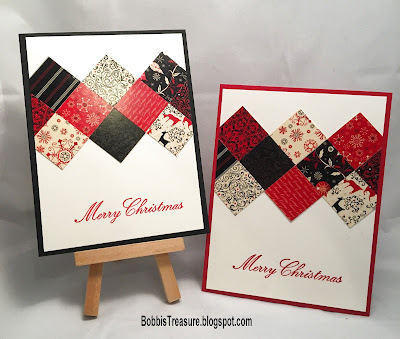 Small squares are the perfect way to feature tiny stamps (like planner stamps)."